One of the most brilliant operations of military history, Jackson's Valley campaign was a strategic diversion to draw strength from McClellan's advance on Richmond (Peninsula Campaign, aka Peninsular Campaign). 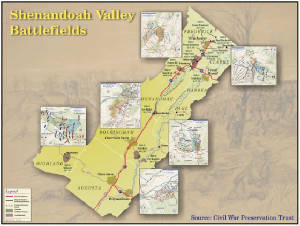 The Shenandoah Valley was important to the Confederates as a source of provisions and as a route for invading the North. As far as the Federals were concerned, the Valley was not a suitable invasion route; however, it was important that they deny its use to the enemy. When Joseph E. Johnston left the Valley for the 1st Battle of Bull Run, the defense of the region was left to the Virginia State Militia. They were not disturbed until Oct. '61, when Federal forces occupied Romney and threatened Winchester. "Stonewall" Jackson was then sent to take command of the Valley district. Unimpressed with the quality of militia troops at his disposal, he requested and was given his old brigade. He was also given three poorly-disciplined brigades from Loring's Army of the Northwest. This brought his strength to about 10,000. Union forces in the area consisted of Banks' corps (18,000) and Rosecrans' scattered detachments in W. Va.
Jackson conducted an undistinguished winter campaign into the snow-covered mountains of W. Va. He failed to capture the isolated enemy garrisons at Bath and Romney, but he did get a considerable quantity of supplies, and he damaged the canal and railroad near Bath. He then withdrew, leaving Loring with a detachment at Romney to block communications between Banks and Rosecrans. This outpost was soon withdrawn in connection with the Loring-Jackson. Early in March Banks moved up the Valley and occupied Winchester, which Jackson evacuated on the 11th. Shields's division (9,000) advanced to Strasburg and Williams' (7,000) remained at Winchester. Sedgwick's division (7,000) was at Harpers Ferry. Banks now prepared to leave for the Peninsula, in accordance with McClellan's plan. Williams started to Manassas on 20 Mar. ; Shields dropped back from Strasburg and prepared to follow. Banks was kept from reinforcing McClellan; Blenker's division was withdrawn from McClellan and sent to oppose Jackson; McDowell's (1) Corps (40,000) was withheld from McClellan; and a hodgepodge of separate commands was established. The latter contributed largely to Jackson's subsequent success. The organizational changes were as follows. Three separate and independent commands were established: McDowell's Dept. of the Rappahannock; Banks's Dept. of the Shenandoah; and the Mountain Dept. under Fremont, who had succeeded Rosecrans 29 Mar. These separate commands reported direct to Washington, and there was no single general on the scene of action to coordinate their operations. Faced by superior forces, Jackson withdrew slowly up the Valley. Joseph E. Johnston had dropped back from Manassas to Culpeper on 9 Mar., and had then taken the bulk of Confederate forces to oppose McClellan on the Peninsula, leaving only the division of Ewell (8,000) at Gordonsville. Banks continued his cautious advance; by 26 Apr. his main force was at New Market, and a strong outpost was at Harrisonburg. Alert to the danger of an advance by Banks through the Massanuttens, Jackson made a forced march to Swift Run Gap. This put him in a flanking position, which not only assured him of continued contact with the rest of the army, but which also made it impossible for Banks to advance farther up the Valley without first driving him from this position. Ewell's division was put under Jackson's orders and moved to Swift Run Gap. He was also given authority to use Johnson's small division. This brought Jackson's strength to 17,000. Fremont, meanwhile, had conceived the ambitious plan of invading East Tenn. As an initial step, Milroy's division was ordered toward Staunton. Johnson withdrew from an untenable position to West View. A junction of Fremont and Banks would have been disastrous to Jackson. With Lee's authority to formulate his own plan, Jackson decided to strike first at Milroy. Leaving Ewell at Swift Run Gap with orders to prevent Banks's further movement up the Valley, Jackson moved off with his own division and Ashby's cavalry. Keeping his plans secret from even his own subordinates, Jackson marched up the Shenandoah to Port Republic, crossed the mountains to Mechum's River Station where trains were waiting, rode to Staunton, and marched to join up with Johnson's division. In the battle of McDowell, 8 May the Union attack was repulsed, and their troops pursued to Franklin. On 13 May Jackson returned to McDowell, and the next day he started for Harrisonburg. Banks, in the meantime, had been ordered to dig in at Strasburg with Williams' division and to send ShieIds's division via Fredericksburg to join McDowell. On 12 May Shields was en route, and Banks was left in the Valley with only 8,000. In the second phase of his campaign Jackson screened with Ashby's cavalry to make Banks think he would advance down the North Fork toward Strasburg. Starting his infantry in this direction, Jackson then turned unexpectedly across the Massanuttens, joined forces with Ewell at Luray, and descended with his full 16,000 on the 1,000 Federals at FRONT ROYAL, 23 May. This force was driven toward Strasburg and, despite a gallant fight, largely destroyed. Jackson had to base his next maneuver on four possible Federal courses of action. Banks could stay and defend Strasburg; or he could leave it by any of three directions: west to join Fremont, north to Winchester, or cast through Front Royal to Manassas, once Jackson was north of the North Fork. Thinking that Banks would most probably remain at Strasburg or head for Manassas, Jackson moved the bulk of his force toward Middletown. Banks had wanted to defend Strasburg, but Gordon had persuaded him that this would be fatal. Gordon conducted a rear-guard action that enabled the bulk of Banks's forces to reach Winchester the night of 24 May. Jackson's pursuit was hampered not only by lack of adequate maps but also because his troops (the crack La. Zouaves and Ashby's troopers) wasted time looting a Union supply train. One column took six hours to march seven miles, and reached Middletown after Banks's column had passed. Despite these frustrations, Jackson pushed his weary "foot cavalry" throughout the night. He knew the terrain around Winchester and realized that every hour's delay would give the Federals time to fortify the critical high ground that covered this place. In a skillful attack Jackson won the battle of Winchester, 25 May. Banks retreated to Martinsburg and crossed the Potomac at Williamsport 26 May. The Confederate pursuit was again ineffective. The foot troops were exhausted. Ashby's cavalry was sent toward Berryville to head off a possible Federal retreat through Snickers Gap (which did not materialize). "Maryland" Stuart refused a direct order from Jackson to pursue because the order had not come through his immediate commander, Ewell. An improvised pursuit on artillery horses was ineffective. After a two-day rest near Winchester, Jackson continued toward Harpers Ferry. On 29 May he was concentrated at Halitown, three miles from there. The Washington authorities were thrown into a turmoil by Jackson's operations. They soon recovered, however, and became obsessed with the idea of trapping Jackson. Despite objections from McDowell and McClellan, who realized that the only purpose of Jackson's operations was to spoil the Peninsular campaign, the civilian authorities-principally Lincoln and Stanton-started directing military operations. McDowell's corps was ordered to converge with Fremont's on Strasburg. Banks and a hastily-organized force under Saxton were to press Jackson from the rear. Jackson was interested in maintaining his advanced position to harass the Federals as much as possible and also to give his quartermaster time to accumulate and evacuate his booty, particularly some valuable medical supplies. By 30 May Jackson knew of the movement of Fremont and McDowell. Leaving the Stonewall brigade to check Banks and Saxton, Jackson started 30 May to withdraw. The train on which he was riding ahead of his troops to Winchester was hailed by a courier, who gave him a message that McDowell's advance guard had captured Front Royal. At the time when McDowell and Fremont were closer to Strasburg than Jackson, the head of the Confederate column was 25 miles and the Stonewall brigade 38 miles from Strasburg. Jackson faced this situation with an uncanny calm, not even communicating the details to his subordinates. Ashby's cavalry checked Fremont's advance, and an infantry brigade halted Shields's division near Front Royal. By noon on 1 June Jackson's entire force 15,000 troops, 2,000 prisoners, and a double train of wagons seven miles long -had cleared Strasburg. A Federal force of 50,000 had failed to close the trap. McDowell's corps of 40,000 had been withheld from McClellan. Brilliant as Jackson's operations were, their success was due largely to the blunders into which they led the Federal authorities. Steele says of Stanton, "by his obstinacy and ignorance of the science of war he probably set back the fall of Richmond and the Confederacy just three years" (Steele's American Campaigns, 229). The three Federal commanders pursued Jackson up the valley. Fremont followed the Confederates up the North Fork with 15,000 men, including Bayard's cavalry brigade of McDowell's corps. 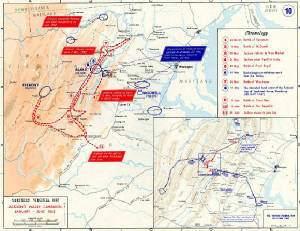 Shields's division moved up the South Fork (Luray Valley) with a view to cutting Jackson off. Jackson had anticipated this maneuver and sent detachments to destroy bridges across the South Fork north of Port Republic so that the two Federal commanders could join forces only by way of Port Republic. He sent a detachment to seize the critical bridge at the latter place to secure his own retreat. Bayard's cavalry caught up with the retreating Confederates on 2 June between Strasburg and Woodstock and routed their rear guard. Ashby rallied stragglers, hastily organized a defense, and held off the pursuers the next day. Ashby's delaying action and the burning of a bridge across the North Fork delayed the Union pursuit until the morning of the 5th and gave Jackson a 24 hour lead. Contact was regained 6 June, and Ashby was killed in a heated skirmish. Shields, on the east side of the Massanuttens, heard the fighting on Fremont's front, but was unable to go to his assistance because of the bridges Jackson had ordered destroyed. Heavy rains further slowed the Federals and added to their problem of replacing bridges. At Port Republic Jackson clashed with the advance guard of Shields's division (Carroll's brigade). In a street skirmish Jackson was almost captured. The night of 7 June Jackson was situated between two hostile columns. Rather than withdraw over the Blue Ridge through Browns Gap, Jackson elected to strike a final blow. Since Fremont's force was the larger (15,000), Jackson planned to block this column with Ewell's division (6,500) at Cross Keys, and to overwhelm Shields's two most advanced brigades at Port Republic (5,000; brigades of Tyler and Carroll). After his victory at Cross Keys and Port Republic, 8-9 June, Federal forces were ordered withdrawn. Jackson moved to join Lee on the Peninsula for the Seven Days Battles. A native of Gainesboro, Virginia, with an inherent wanderlust and thirst for adventure, Casler enlisted in June 1861 in what became Company A, 33rd Virginia Infantry, and participated in major campaigns throughout the conflict, including Chancellorsville and Gettysburg. Captured in February 1865, he spent the final months of the war as a prisoner at Fort McHenry, Maryland. His postwar narrative recalls the realities of warfare for the private soldier, the moral ambiguities of thievery and survival at the front, and the deliberate cruelties of capture and imprisonment with the vivid detail, straightforward candor, and irreverent flair for storytelling that have earned Four Years in the Stonewall Brigade its place in the first rank of primary literature of the Confederacy. This edition features a new introduction by Robert K. Krick chronicling Casler’s origins and his careers after the war as a writer and organizer of Confederate veterans groups. "A must have for researchers, buffs, and American historians...General "Stonewall" Jackson and his brigade shall forever have a place in the annals of world history."